It's that time of year again when the ghosts and goblins are wandering the night in search of treats. There will also be children. I kid, of course, but it's a time for kids and a time for kidding. It can also be a time for serious reflection, though. In some of the oldest traditions, this was the time of the New Year, a time to remember and honor the past while looking toward the mysterious future. A seat was saved at table for the departed loved ones. Goods were sought and set aside for the coming winter. It was very much an Anything Is Possible kind of time. Let this be your Anything Is Possible kind of time. Honor your past and respect what it has taught you, look forward and prepare for what is to come, but live today. Never forget to live today. 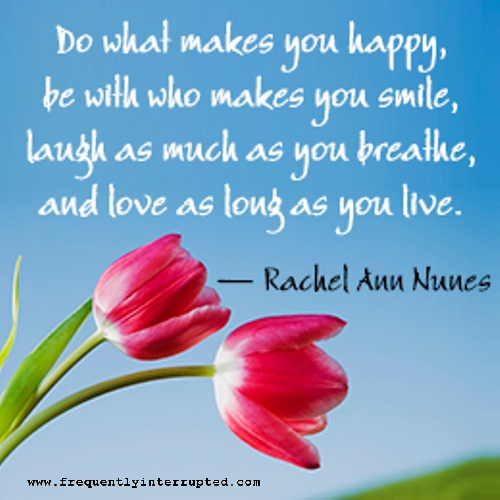 And never forget to have fun! Look around you. Do you see all of those spectacular costumes? Do you hear all of that laughter? Can you feel the excitement? Join the children, laugh with the children, and remember, sometimes they understand better than we do. They haven't forgotten the important stuff. If you're out and about, please be careful and pay attention. Children may still remember some important stuff, but Watch Where You're Going when excited often isn't on the list. 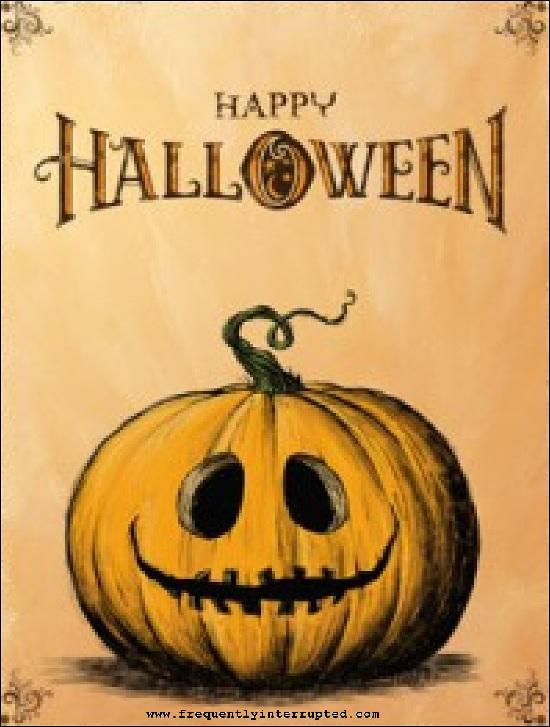 Let's keep it fun and safe for everyone, and have a very Happy Halloween. We're running Halloween posts from the past this week, in case you missed them or just might want to read them again. Meanwhile, we are preparing for Halloween at Casa Frequently Interrupted. Hope you have a great week, and a great holiday. 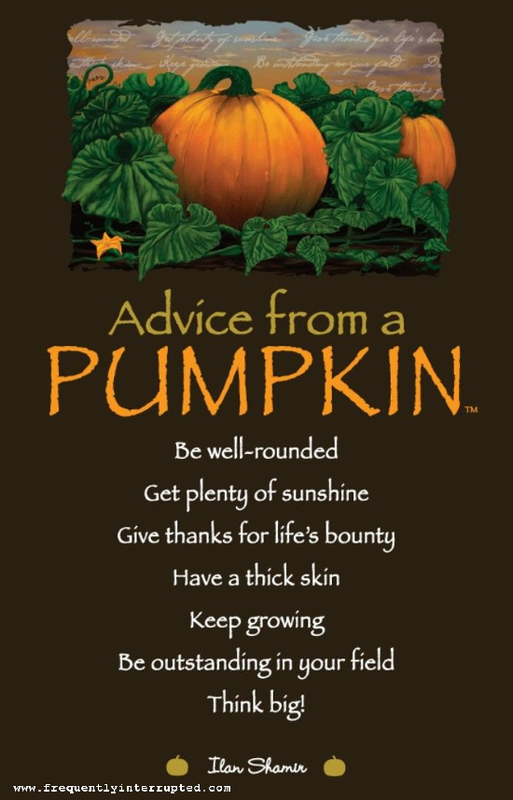 Something to consider this spooky season. 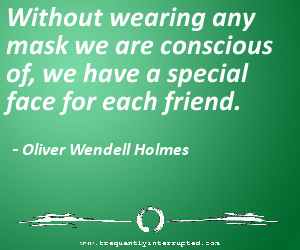 Most people wear masks at various times and for various reasons. It’s so common, in fact, that people who never (or almost never) wear masks are generally looked upon as being socially or emotionally underdeveloped, or possibly even both. This is not always a conscious consideration - we love to say that we prefer things honest and real - but it is true just the same. We are so accustomed to the presence of masks that we even sometimes wear them in private, and then tell ourselves that the mask is our real face. A mask is a mask, no matter how often we call it a face, but that doesn’t mean that it’s a problem. 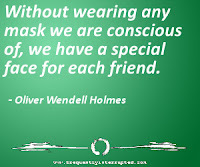 A mask is a tool and, like most tools, it can serve a useful purpose or it can be misapplied. When tools are misapplied, things tend to break. Unfortunately, when this tool is misapplied, it is often hearts, minds, and even lives that break. Masks can be very useful and even powerful tools but, as is often the case, they are also dangerous tools, and should be used only with appropriate care and consideration to minimize their hazards. I can already hear the argument, “Honesty is always the best policy and you should never hide behind a mask.” Of course you’re right, and when Aunt Sally asks you how she looks, you always and only tell her the exact truth, don’t you? If you answered “yes” to that, I’m guessing they don’t offer sensitivity training at your place of employment. There is a time and a place for everything, and that includes honesty. The people who tell you, “Hey, I’m just being honest,” are usually just being callous and lazy. That’s not the same thing. Honesty may be the best policy - and it is a policy I follow personally, so I am certainly not knocking the idea - but “best” does not necessarily mean “only”. There are times when it is a good idea to show a different face - a mask - to the world, and we have developed a variety of socially acceptable ways to create and use these masks. If you can help Aunt Sally with her appearance then you might find a gentle way of doing so. If you can’t help, though, or, even more important, if Aunt Sally is perfectly happy with her appearance and any negative input from you is only going to cause hurt feelings with no positive benefit, you smile and tell her how fabulous she looks. Being kind is sometimes more important than being honest. Being honest, though, can sometimes be the way to be kind, even if it might not seem so at the moment. If Aunt Sally’s hat is going to violate zoning ordinances at the party she is attending, it may upset her that she now has to rethink her entire outfit, but that would be better than arriving at the party and being locked out. This is a weird example, I know, but you get the idea. You have to think about things in complete context to keep honesty and kindness in a proper relationship with each other. You can’t just rely on “I’m always honest,” or “I’m always kind,” because life is more complicated than that. 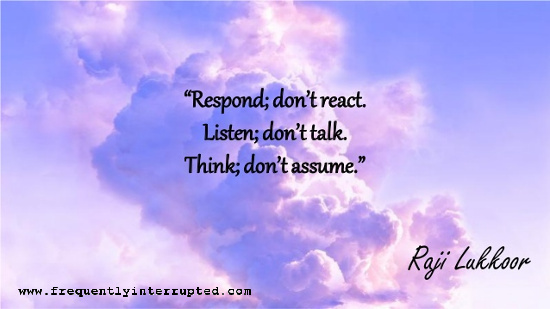 If you are going to navigate life with mindful intent then you will have to think things through occasionally and not just rely on blanket rules. It is entirely normal that you may need to keep a collection of masks handy, and have some skill at switching them out as necessary. Your face is the better face, and a healthy response to the world requires showing your face the majority of the time, but a mask can be the healthy response under a variety of circumstances. Strangers don’t need to always know your innermost thoughts, and sometimes “How do you do?” just means “Hello.” Life is a complex system of moving and interacting parts, and living a healthy life means that we make every honest effort we can to work within that complex system without causing it or ourselves to break down. Take, for example, a situation where you have a pain, you have a solution for that pain at home, and you have a well-meaning friend between you and home. Your friend asks how you are doing, and will be entirely sympathetic toward, but will also be unable to assist in any way with your pain. In fact, despite honestly meaning to help, explaining the situation to your friend will only serve to delay you from getting to the solution, prolonging your pain without benefit to anyone. You can be open and honest, explaining the situation to your friend anyway, or you can grin and bear it, put on a happy mask, and promise to catch up later. Choose wisely. There is no wrong answer to that situation, in case you were curious. I know which option I would favor, but there is nothing wrong with either one. 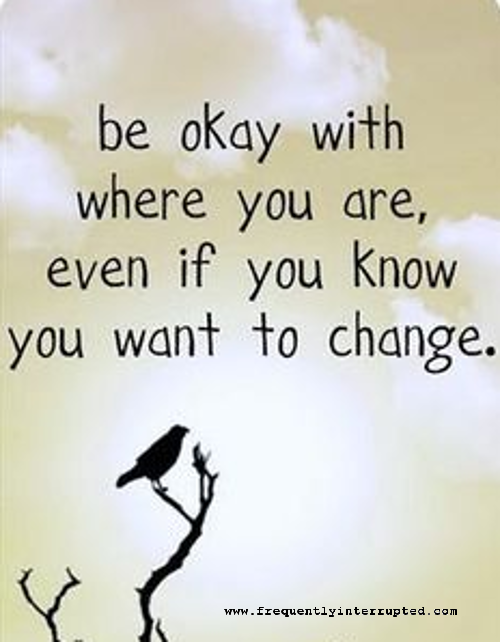 If you are moving forward without causing unnecessary damage, you are meeting expectations, at least. The point to this little exercise is simply to demonstrate that choosing a mask can be a good answer. I believe that it can even be the better answer in some circumstances, but you will have to make that determination for yourself. I only offer, as evidence, the fact that wearing a mask in this situation would lead to a speedier resolution of pain without transferring the pain or leading to a new round of pain as a result. If you would feel better about it, by all means, explain to your friend later. Just understand that you haven’t hurt anything, and you have helped something to stop hurting. There are two restrictions that I would apply to the healthy use of masks: Masks are for temporary use only, and masks are not for private usage. The first one might seem obvious, but that is often not the case. We are creatures of habit, and anything we do often or long enough tends to stick. If we spend enough time wearing masks, we get used to wearing masks and forget to take them off. Honesty really is the best policy, though, and it’s best to show your real face as often as possible. If you find that it is not safe, healthy, or comfortable to go sans mask on a regular basis, you might want to examine the circumstances making this the case. There may be something else you can address that could lead to a resolution of both issues. Odds are, you are not the Phantom of the Opera. Remove the mask and let your face breathe whenever possible. It’s good for you. You cannot live mindfully by lying to yourself. Those are incompatible actions. If you are wearing a mask in private - if you are telling yourself that everything is fine when it is not fine - you are actively preventing mindful awareness. Worse, you are preventing things from becoming fine. You cannot fix a problem that you will not address. We occasionally wear masks in public to prevent pain and to keep things running smoothly. Wearing a mask in private, though, ultimately causes pain and prevents things from running smoothly. That is the opposite of healthy behavior. Masks can serve a useful function, and using them can be a healthy outlet, as long as we maintain such actions in reasonable proportions. It’s the season to be aware of masks and disguises, hopefully in fun and entertaining ways, and it’s a good time to examine how they can fit into our daily lives. Just make sure that you’re wearing the mask and not being the mask. As long as you maintain that distinction, there’s a good chance that you are at least pointed in the right direction. What scares you? What wakes you up in the middle of the night with cold sweats and panting breathes? What haunts your dreams and disturbs your days with unchecked dread? Most of us have these things that go bump in the night, though we may have difficulty discussing them. It is often easier to pretend to have no fear than to face the fear we do have. The fear is still there, though, and it will often reach out and bite you at the most inopportune times if you follow this course of action. Better to face it head on and deal with it than to let it sneak up on you unaware. The ghosts of the past can be one of the most difficult fears to face. They’re past. They’re gone. They are not present to argue with and wrangle into submission. These things that one might think should make them easier to dismiss turn out to make them more difficult to address. A ghost cannot reach out and physically harm you, but you can’t reach out and physically shove a ghost out of the way either. When that ghost stands in the middle of the room and howls at you and rattles its chains, you can’t use conventional methods to make it go away. We all have a tendency to drag these ghosts around with us. Memories of lost love or past injuries. Regrets over words unsaid or deeds undone. Guilt over words said or deeds done. The past informs the present, and we often relive our worst moments over and over again. The very times in our lives that we maybe should not have lived that way the first time are the ones we often repeat incessantly in our dreams and thoughts. Spending so much time living with ghosts, though, can’t fix the past. It can only damage the present and potentially cancel the future. We cause pain to today by ignoring it in favor of yesterday, and then today becomes another yesterday full of regret, and the horrible cycle continues. Break the cycle, and make today the best day you have ever lived. If you look back on today from some future tomorrow, make it a day you look back on with joy instead of pain. Even better, make those tomorrows days that you won’t want to look back from in the first place. Ghosts have no power except what we give to them. Don’t give them power and you don’t have ghosts. That may sound simple, but it can be one of the hardest things you ever do. If you believe that not thinking about something is easy, I challenge you to not think about a white elephant right now. You thought about it, didn’t you? A magnificent white elephant went trumpeting through your thoughts just now … and it just did it again. That is how thought works. Trying not to think about something is one of the best ways to trigger that very thought. Instead, acknowledge the thought, give it a nod, and then think about something else. Don’t ignore it. Don’t pretend it isn’t there. Just don’t give it any importance. “Oh yeah, you again. Okay. Next.” Eventually this becomes habit, and the importance is naturally gone. This is how we exorcise ghosts. Goblins can be tricky because they are right here, right now. They have a current physical presence, and they make sure you know about it as often as possible. They are bill collectors presenting Past Due notices; bosses scheduling annual evaluations; children with twenty nine hours of activities to somehow fit into 24-hour days. Goblins are the term paper you spaced until now it’s due tomorrow. Goblins are the everyday horrors that plague our lives with discomfort and unhappiness. Sometimes they’re friends with the ghosts and act in tandem, but more often they are just agents of chaos acting in any way and using any tool to wreck the present and take away good possibilities for the future. Goblins may have a physical presence, but you still usually can’t just dropkick the little buggers over the horizon. For one thing, goblins are often our own fault (Who didn’t do that term paper when you had time? ), and you can’t really solve your problems by punishing yourself. When the goblins are someone else, there are usually legal or social ramifications that would prevent a more direct physical response. Also, a more direct physical response is often just rude, and tends to create even more goblins. Don’t do that. Don’t make more problems when trying to solve the existing ones. That is one of the more difficult things about goblins: They have an amazing capacity for reproduction. If you’re not careful in how you handle them, your Goblin Removal Procedures can easily becomes Goblin Multiplier Procedures instead, and you’ve just made the situation worse when you were trying to make it better. Even if you don’t add to the army of goblins, it is still far too easy to replace one goblin with another one. That make not make things worse, but it doesn’t make them better either. The best way to deal with a goblin infestation is honest mindful awareness. Know where you are, know what you’re doing, and know your results. Not where you want to be or where you think you are, not what you want to be doing or what you think you’re doing, and not what you want the results to be what what you think the results might be, but the real ones. Be present. Be aware. Be real. If your actions are attracting goblins, address your actions. If it’s not your actions but the actions of other people in your location, perhaps it’s time to reconsider your location. If you have no choice about your location - rare, but possible - take precautions and make sure that you are not adding to the goblin summoning. We all have fears, but most of our fears are ghosts and goblins. They’re not real, or they’re only as real as we make them. When you are giving energy to the things around you, make certain that you are not powering ghosts and goblins. If you are not currently equipped to make the world a better place, at least don’t make it worse. There are fears in this world that are not ghosts and goblins. They are less common, but no less real. A house fire, a violent storm, a random act of hatred, an ill child. These and other such events can be terrifying in their very real ability to take away from live that which makes it life. We face these things as best we can, but remember that we all face them, and we are all afraid sometimes. 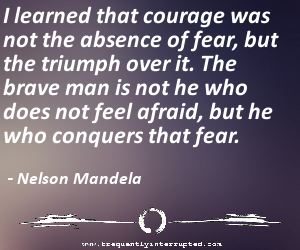 Courage is not the absence of fear. 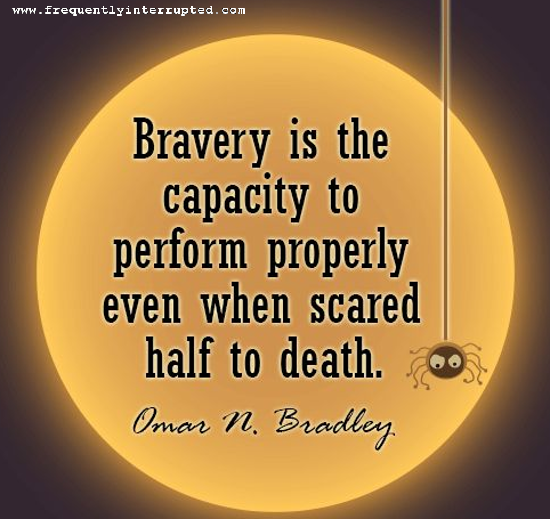 Courage is moving forward despite fear. No courage is required when you are not afraid, only when you are. Don’t doubt yourself because you’re afraid. Acknowledge your fear and move forward anyway. Then you will have no reason to doubt. Perspective is the king of the world. The way you look at the world changes the world you see. You may not be able to will the hurt away or imagine in all of the light, but you can shape the perspective and enhance what you choose to embrace. 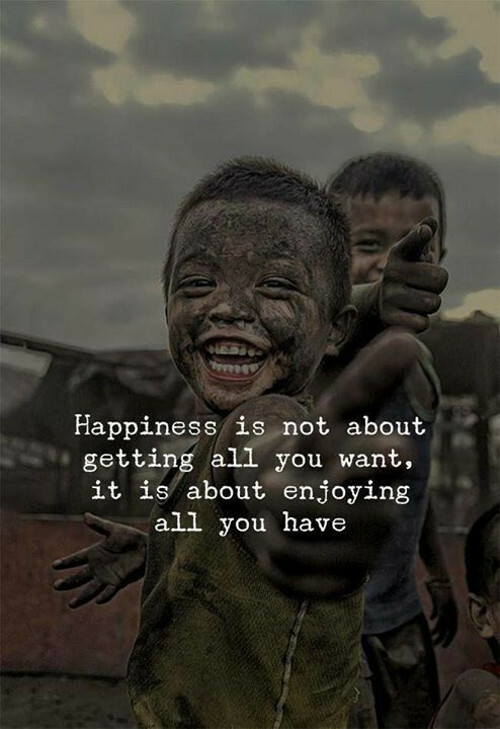 If you want more happiness in the world, be more happy with the world. We often accept things we have no business accepting, and the worst of it usually comes from ourselves. Being a kind, compassionate, patient person does not mean being a doormat. I'm not sure where that myth got started, but it's long past time for it to end. 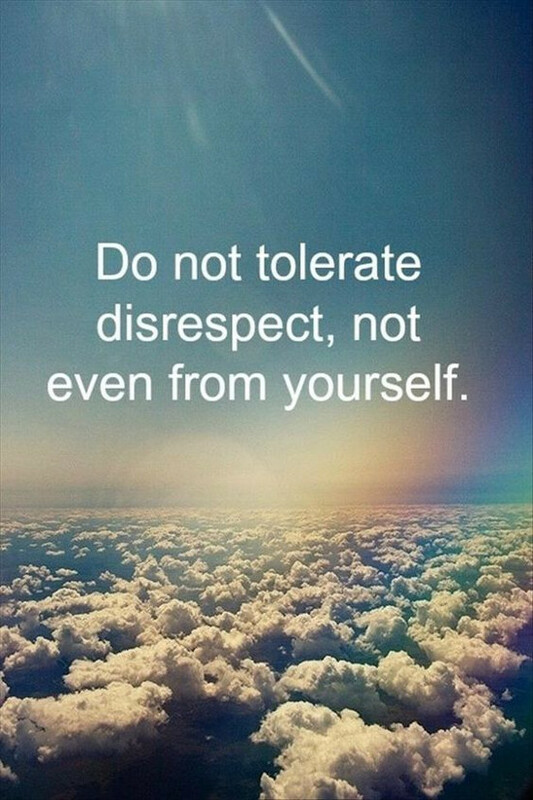 You can kindly, compassionately, and even patiently remove disrespect from your life. Doing so will make things much better for everyone. An easy life does not make a strong person. 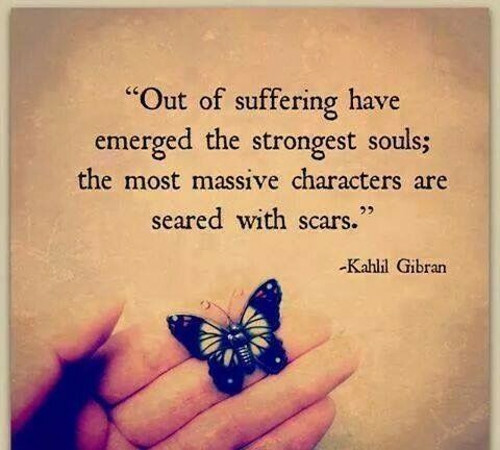 Scars are the visual memories of battles we got through and, hopefully at least, learned from. When you come out on the other side of some great struggle, you often come out with less, but you come out as more. Some pieces have been burned away in the fire, but you are tempered and stronger for having made it through. Do not be ashamed of your scars. 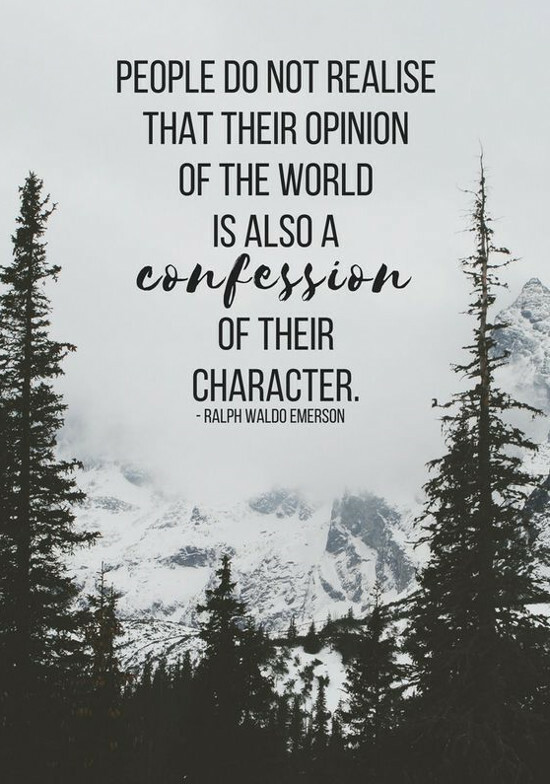 The opinions we put out in the world often say more about ourselves than what we think we're describing. You opinion indicates your perspective and sometimes even your background. It demonstrates things that are important to you. Aside from the specific thing you're saying, are your opinions promoting a you that you want them to promote? Have you examined that question? "He had a lot of money and an expensive car" are not the epitaph to shoot for. If I leave this world having owned nothing fancy, but someone can stand up and say, "He helped me," I will have been a success. If I can leave the world a little bit better and a little bit brighter, I will have earned greater reward than profits can buy. We need to remember that the human race is more human than race. Be good to people, and help people be good. You are not here to be miserable. You are not here to live someone else's life. It's amazing how often trying to do the latter leads to the former. Live your life, without interfering in the ability of other people to live their lives, and you'll be amazed at the results. Life is not always roses and sunshine, but having the right people around you can lighten the load, even when the sky is dark and the path is unclear. 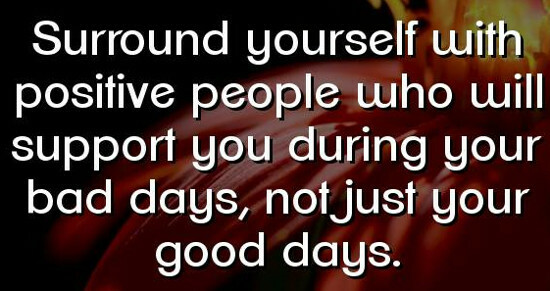 Surround yourself with people who will lift you up and help you out. Even the darkest days can be a little bit easier when you have the right people on your side. Most people react. Most people talk. Most people assume. This is a shining example of why we face many of the issues we face. When you think about something, you can learn. When you listen, you can you can learn. 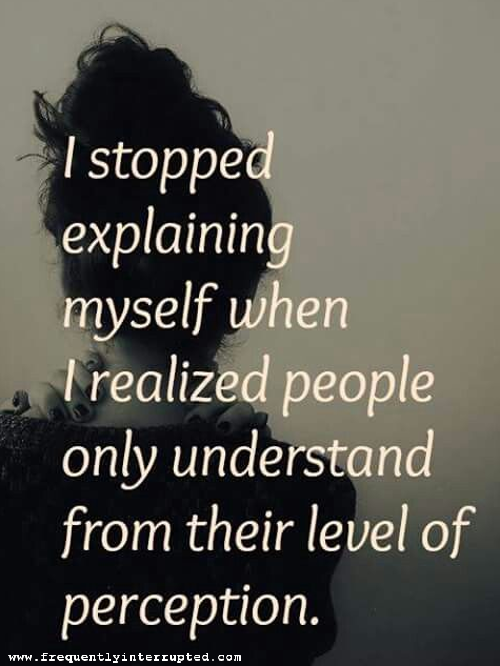 When you respond, you can apply what you have learned. Take the time to learn and then use that appropriately. 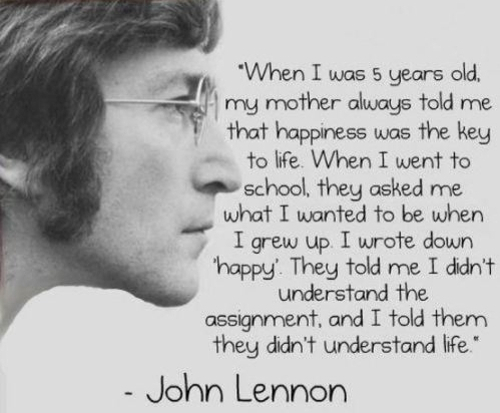 Most people don't understand life. They muddle through completing assignments and checking boxes. They are alive but they are not living. Be someone who is living. Do life because it is alive, not to get a good grade. Learn the difference, and begin to understand life. There is a time to follow and a time to blaze your own trail. Learn the difference, and understand that most of your life will be the latter. 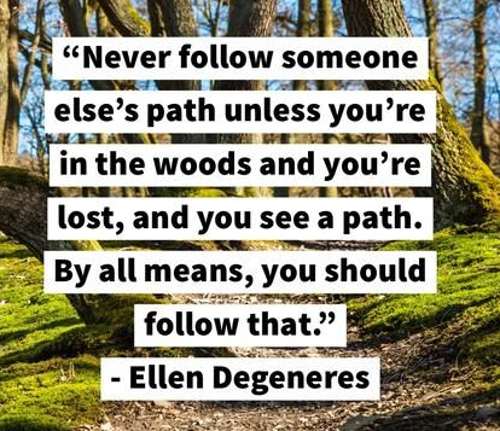 There are many paths through life, and only yours is right for you. 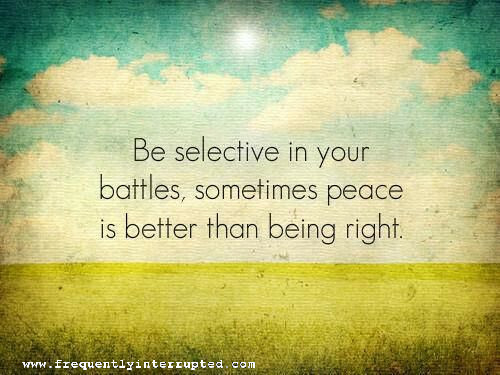 Sometimes you need to fight, but not every time. There are fights that can improve the world, and there are fights that can only wear you down. Try to learn the difference, and skip the fights that don't serve a greater purpose. You need your strength, and you need to not spend it on every useless engagement that comes along. You have the right to walk away. There are so many wonderful experiences to be had in this life, and the time to enjoy them is limited. 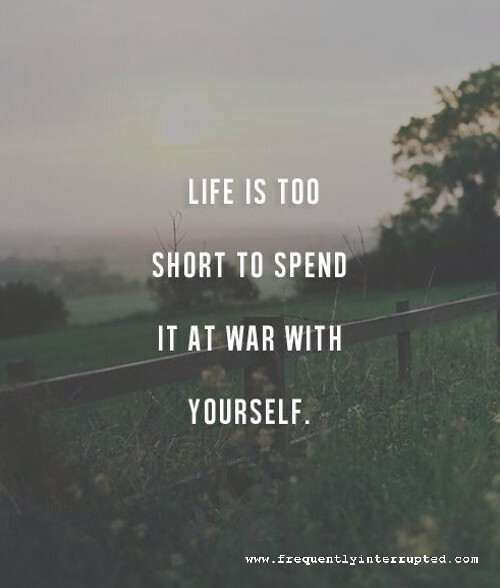 Don't waste what time you have fighting with yourself. Learn your mind, learn your heart, and go forward. Always go forward. Find the new and keep learning. The more you learn the more there is to learn. You won't run out, and you won't have time for petty nonsense. Go forward. Let your life be your message. People will see what they will see, and you only have some much control over how that works. If you are living your message, the ones who want to learn may ask for additional details, but they won't need explanation. They will see it in how you live. The ones who want to see something else will see something else no matter how you explain. Be the message. The daily fight is tiresome, but you've won every fight so far. With a track record like that, you have every reason to believe you'll keep winning. You're stronger than you realize, and you can be stronger still. Don't give up. 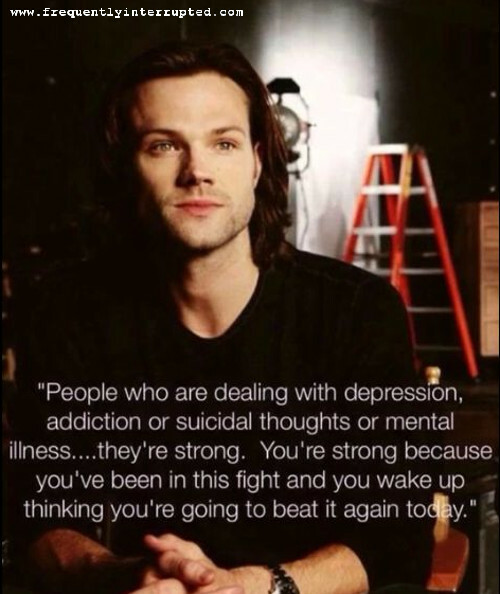 Keep fighting. Life is a moving target, and you're never going to be 100% of anything you want to be. Working on self improvement does not mean disliking who you are. You are a unique perspective of the universe right now, and you will be another unique perspective tomorrow. Appreciate today while looking forward to tomorrow. They work well together.